FDs are one of the oldest and most common methods of investing. When it comes to assured returns, choosing the right type of savings scheme makes all the difference. Fixed Deposits let you make the most of value-added benefits as you create wealth atlow risk. Government Companies &ï¿½You can also go for Fixed Deposits with Banks. How to choose a good company deposit scheme? Don’t go for Companies which offer interest much higher than market. Ignore unrated Company Deposit Schemes. Look at only AA or AAA rated schemes. TDS will be deducted when interest payable or reinvested per customer, per company exceeds the amount applicable as per statutory rules in a financial year. Since last Financial year these have emerged as an addtional tax saving opportunity for the investors. With a secured format of debentures and a guaranteed interest rate these can be very useful tool for tax saving for the persons in tax slab of 10% or more. Tax Benefit: The benefit under section 80 CCF is limited to Rs.20000 in a year & this is over and above the 80C limit of Rs.1 lac. 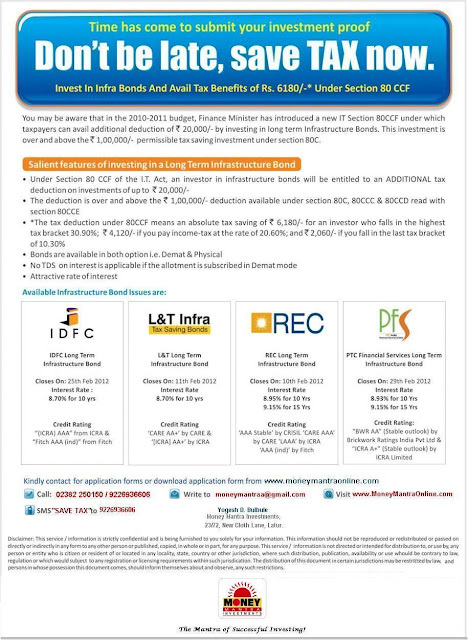 Following are the details of currently available Infrastrure Bond issues.